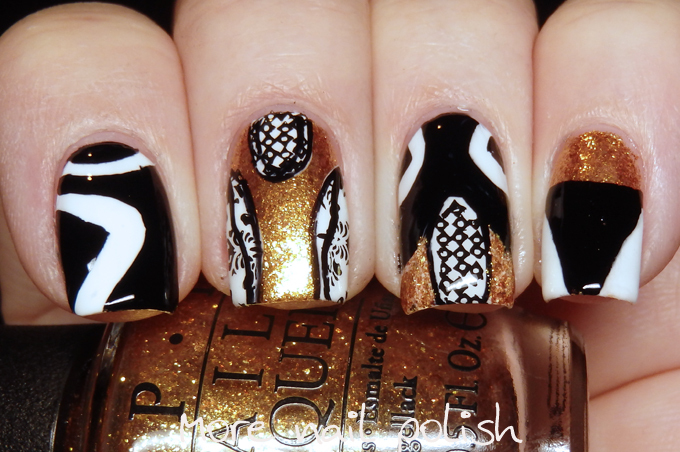 Oh I love it when I combine nail art challenges and feel clever. I'm feeling super clever with today's nail art that is for sure. 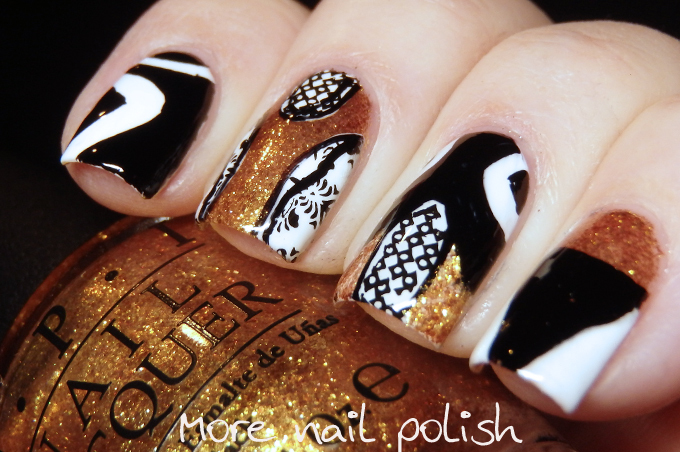 The two challenges are the Digital Dozens Fashion, and 40 Great Nail art ideas with insects. 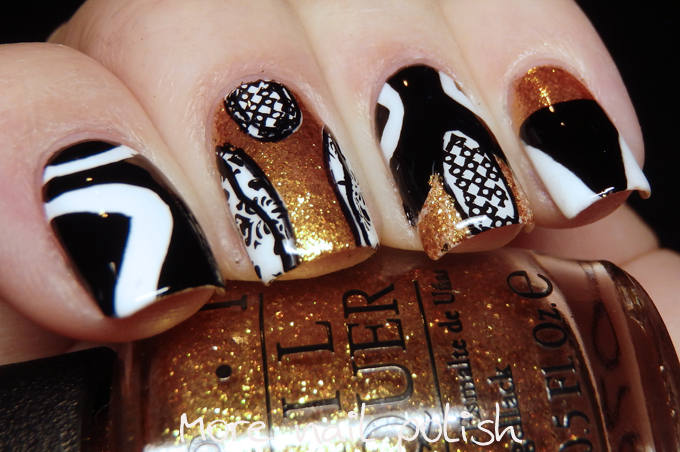 So what does that mean, it's means finding fashion that in inspired by insects and then creating nail art on that. I very nearly went with a butterfly design, specially a monarch butterfly, because there are some amazing dresses based on the monarch butterfly, but then I spotted this beetle inspire dress and went with it instead. I'm disappointed that I didn't choose a better yellow gold, rather the OPI Golden Eye, which was just to orange rather than the green gold that I should have used, something like Ozotic 507 would have been heaps better. This was a bit of a mix and match of different aspects of the dress, mostly freehand with a few stamped accents. 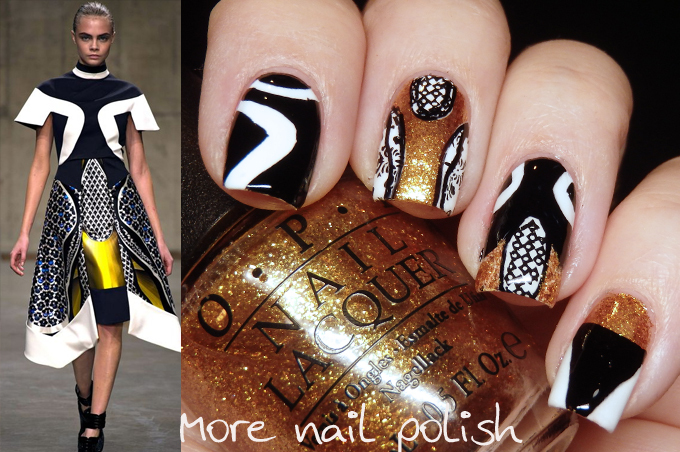 Here are the inlinkz for fashion nail art. Wow, good job in figuring out a way to combine the challenges! These are so cool! That is great how you found inspiration for both challenges!